Grade A Korintje (Indonesian) cinnamon from PreparedPantry.com. The botanical name for the spice, Cinnamomum zeylanicum, derives from Ceylon, the Colonial name for Sri Lanka, where the plant originated. Cinnamon is a laurel tree, one of perhaps 4000 species of laurel that grow worldwide, mostly in warm or tropical regions. Laurels are especially Southeast Asia and Brazil. Cinnamon is known by many different names in the languages and dialects of the Pacific Rim, where it originated, but our Western word comes from the Greek kinnámmon, although it has roots in Phoenician and is in the Book of Exodus in Hebrew as qinnamôn (30:23). In fact, there, Moses is commanded to use both sweet cinnamon and cassia in the holy anointing oil; you’ll learn the difference between the two in a moment. Cinnamon gets props for its fragrance in Proverbs 7:17–18 and in Song of Solomon 4:14. Spices were rare in antiquity, because they came from distant lands and travel was difficult. They were regarded as gifts fit for royalty and potentates. The spice was imported from China to Egypt as early as 2000 B.C.E. Later, it was commonly used on funeral pyres in Rome. In in 65 C.E., Emperor Nero is said to have burned a year’s supply of cinnamon at his wife’s funeral. Alas, ancient writers have left no records of cooking with cinnamon. Did it perfume their lamb and poultry as well? Sweeten their drinks and desserts as it does today? One thing’s for sure: Without cinnamon, apple pie, rice pudding, cinnamon buns, winter squash dishes, Red Hots and other cinnamon candy, breakfast foods and quite a number of world cuisines would be sorely lacking in flavor excitement. Cinnamon is the fine inner skin of fragrant tree bark, the cinnamon and cassia trees, which grow wild throughout Asia. 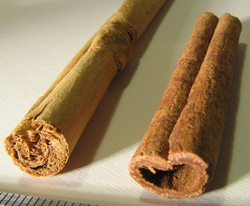 There are two principle types of cinnamon: cassia and “true” cinnamon. While professionals distinguish between cassia and true cinnamon, to the consumer, cassia is sold as cinnamon. Cassia cinnamon, from the cassia tree, is native to Southeast Asia, especially southern China and northern Vietnam. It has the strong, spicy-sweet flavor most Americans are familiar with. 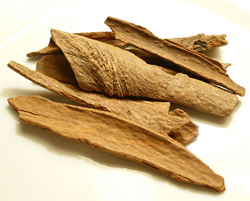 Photo of cassia, the Saigon cinnamon variety, by Badagnani | Wikimedia Commons. Vietnamese cassia (Saigon cinnamon, Cinnamomum loureiroi) and Chinese cassia (Cinnamomum aromaticum) are the sweetest and strongest varieties. Vietnamese cinnamon is considered by many to be the world’s finest cinnamon; it and the Chinese cassia are not only sweeter, but more aromatic and more powerful (“spicier”) than the Indonesian Korintje cassia commonly sold in supermarkets. While they come from the same tree, they are harvested and processed differently. Korintje cassia cinnamon comes from Indonesia, usually Sumatra (Cinnamomum burmannii). As “supermarket cinnamon,” it is the most familiar to us. Yet, it comes in A, B and C grades. B and C grades are sold in supermarkets and price clubs, and large containers at low prices generally means C-grade cinnamon, and can be bitter and astringent. A-grade Korintje cassia is sweet and mellow. According to the Food and Agriculture Association, Indonesia produces 40% of the world’s Cassia cinnamon. Photo of true Cinnamon (left) and Korintje cinnamon (right) quills by Antti Vähä-Sipilä | Wikimedia Commons. Both barks curl when dried in the sun. On the other hand, Saigon cassia and Chinese cassia barks are not supple enough to curl into quills. They are sold as pieces of thick bark, above. Ceylon or “true” cinnamon, from the cinnamon tree, (Cinnamomum zeylanicum, also called Cinnamomum verum) has a much different flavor: a less sweet, more complex, citrusy flavor. 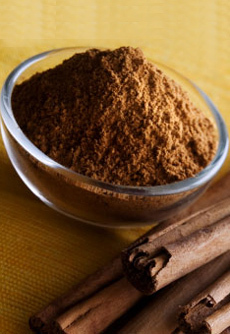 Ceylon cinnamon is also known as “old-fashioned cinnamon” and is the preferred cinnamon in many areas: The special flavors of English and Mexican sweets comes from Ceylon cinnamon. Ceylon cinnamon has a higher oil content and a sweeter flavor than cassia. The bark is peeled from the tree and the outer bark is removed, unlike cassia, which uses both the thick outer bark and the thin inner bark. Cinnamon thus has a finer, less dense and more crumbly texture. According to the International Herald Tribune, in 2006 Sri Lanka produced 90% of the world’s true cinnamon.